Having moved my shack some time ago I lost the use of the 70cm antenna I had there so had to put up another one. Rather than move the old one I thought why not homebrew something new. A search through old PW found a suitable antenna. 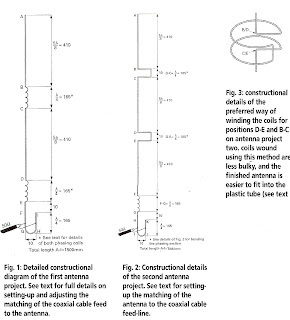 The diagrams were from PW July 2006, although the antenna design was originally from September 1992. G4XBY is the callsign of the July 2006 write up. What I built is the one in figure 1. The antenna is a 5/8 over 5/8 colinear. Materials should be 1.5m hard drawn copper wire, I used earth wire from 2.5mm domestic T&E although I believe thick coat hanger wire could also be used (as another is building his using it). You might have to play with lengths a little though. The Figure 1 and fig 2 have the dimensions in mm. Figure 2 is a stacked set of 3 5/8 sections using phasing lines rather than phasing coils. The two phasing coils are made by bending the wire at point B at 90 degrees and taping it hard up against a 12.5mm former (1/2" dowel was used). Figure 3 has a close up. Measure 178mm from point E, this is the very bottom of the matching section betwen G and H on fig 1. Make the bend as per the diagram for the bottom. To set the antenna up, clip (I used croc clips) the centre of the coax (RG213) to the long side and the ground to the other, about 1/2 way up from the bottom. The length of the lead should be an odd number of half wavelengths at 70cm. If f = 434MHz then this is 346mm, applying 0.66 velocity factor for the coax and you arrive at 228mm. The coax lead for me was 7 times this length. If you don't do this all sorts of fun and games will ensue! I tied the antenna to a bit of string and hung it from a tree in open air near the shack, about 6 feet AGL. Then I looked at the antenna with a MFJ-269 and again with a MiniVNA. And adjusted the point of the match for the lowest VSWR, it was not that sharp but I found was just under half way up. NB you must make BOTH side equal from the bottom. Then I added a more permanent coax cable by soldering it where the croc clips were, first sliding a 40mm OD pipe cap I had drilled a 10mm hole in over the coax (RG213), make sure you put it on the right way 1st attempt I didn't and had to reassemble the antenna, check the VSWR iss still low and then covered the joint with liquid electrical tape (http://www.sotabeams.co.uk/) and after it set retested. I had a spare section of 4omm OD water over flow pipe after adding a gutter to the green house and now the cap makes sense and I slid the antenna into it. Was bit longer than needed but did not trim it. I added another screw cap at the top, at the bottom using the cap I had fed the coax through and then used pipe sealing cement (smells like old airfix glue) on both end caps, the screw caps can be undone if needed for an inspection. I added a little 3/4" x 6mm screw to secture in place with a blog of the liquid tape over it. The 40mm OD pipe is WAY TOO big really and something like 20mm trunking would have been fine. For an antenna with more gain you can add sections, and make it longer. No idea what the gain is though and so far only managed a single 70cm contact with it to the local repeater to test it. GB3PY. The original antenna was a Diamond V2000 (2m, 70cm and 6m colinear) and I found this worked just as well. You can also make the phasing sections as lines rather than coils too and figure 2 shows the details. I built mine a bit differently but PW gave these suggestions for mounting. Already state in the post. The wire to make the coil is is 165" long. The coil overall length is 165mm not 165" including the short vertical section.... the coil starts in one direction, 3/4 of a turn, add a short vertical section (The vertical length was 10mm) and then repeat the 3/4 turn coming back on yourself. The vertical length depends on your former I used a 12mm diameter piece of dowel. If you look vertically DOWN on the coil you will see each side is 3/4 of a turn. From the original article on the coils. 4 turns, 165 mm long, 7mm turn spacing, 12.5mm diameter. 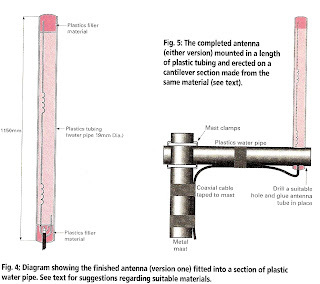 Figure 3 is for the phasing stubs. a self-gripping wrench, sometimes known as a ‘mole’ wrench, for this job. Keeping about 7mm between each turn, wind the wire in a clockwise direction around the dowel as tightly as possible. After four turns, this should bring you to point C, which should be in line with the section A-B.